NASHVILLE, Tenn. (AP) — The Tennessee Titans are back in wait-and-see mode with Marcus Mariota. The quarterback is trying to recover from a stinger that knocked him out of their last game. 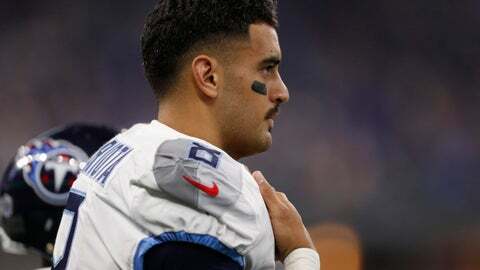 Mariota said Wednesday that the stinger, which came from a hit to his head in last week’s 38-10 loss to the Colts, left him with some numbness in his throwing arm. But Mariota said the injury is not related to the nerve issue in his elbow that cost him playing time in September. Mariota also said his grip holding a ball is fine. He wore a partial glove for five games to help him grab the ball better when recovering from the injured elbow. Mariota took part in individual drills Wednesday. The Titans will not issue an injury report until Thursday with their next game Monday night in Houston (7-3), though coach Mike Vrabel said Mariota was limited. “We’re hopeful that he’ll progress as the week goes on,” Vrabel said. The elbow injury kept Mariota out of the second game this season, a 20-17 victory over Houston. The Titans (5-5) desperately need a victory to pull within a game in the AFC South going into the final month of the season for a team looking for a second straight playoff berth. The No. 2 pick overall in 2015 out of Oregon has missed eight starts in his Tennessee career, though Mariota came off the bench in Week 3 in Jacksonville after backup Blaine Gabbert was knocked out of the game with a concussion. The quarterback needs only 10 more passing attempts to qualify for career completion marks in both the NFL and franchise history with at least 1,500 attempts. Once he throws his 10th pass, Mariota will top the late Steve McNair in both the highest career completion percentage in team history at 62.6 percent and passer rating at 88.5. Mariota still has his doubters on whether he’s the quarterback for this franchise long-term. The Titans picked up his fifth-year option for 2019 at a price of $20.9 million, but the offense in the first season with coordinator Matt LaFleur has struggled mightily. Tennessee ranks 30th in both total offense and yards passing (183.7 yards per game). The Titans rank 28th in points scored. He’s already been sacked 29 times this season — more than each of the past two seasons when he played 15 games apiece. Mariota was sacked 38 times in 12 times as a rookie playing 12 games. The Titans have an extra day of preparation and healing with the Monday night game. Mariota says he doesn’t believe he needs a “whole lot” of practice to be able to play. “I feel like I’ve played enough ball that if it comes down to it, I’m feeling good enough to go out there and play I’ll be ready,” Mariota said. Vrabel said they believe practice is important. “Certainly there’s a fine line between trying to get a guy back and practicing,” Vrabel said. Notes: Titans defensive coordinator Dean Pees, who spent Sunday night in a hospital, returned to work Tuesday. He was on the field Wednesday at practice. “He is back, and we are thankful to have him back here, and I would say healthy,” Vrabel said.